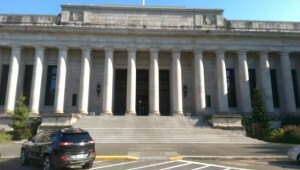 I recently argued before the Washington Supreme Court. Folks ask what that is like. I will try to give a taste of the experience. 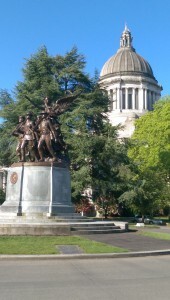 If you haven’t been to the capitol in Olympia, you should go. The buildings and grounds are very beautiful. This time, I was lucky to hit a perfect spring day, and the trees had just leafed out. The grounds are immaculate. I saw numerous groundskeepers. The floors, stairs, pillars, and some of the walls of the buildings are marble. There is a lot of stone outside. The courtroom itself has incredibly high ceilings with intricate woodwork. The least attractive feature of the room is the bench where the judges are, which unfortunately is what you see a lot of on TV. I had some extra time to walk around and enjoyed every minute of it. If you have watched the Supreme Court on TVW, you may have noticed the multiple gavel strikes as the justices enter the court room. While I was there, I learned that the bailiff uses multiple gavels. They are labeled and for sale. A lawyer or party may wish to purchase a gavel as a souvenir. The money goes to projects on the building itself. The Supreme Court takes very few cases each year. The Supreme Court can decide which cases it will consider. It only takes cases to resolve important open questions. It is not enough that a lower court has erred. There has to be an important policy question raised by the case for the Supreme Court to spend time on it. As such, the Supreme Court hears argument on, and issues opinions on, approximately 45 cases a year out of about 1500 filings. By contrast, the Court of Appeals, which is the lower appellate court, gets 3500 filings a year and issues opinions on 1500 of those—almost half. Consequently, lawyers appear rarely before the Supreme Court except for those lawyers whose practices are primarily before the Supreme Court, such as those in the Washington State Solicitor General’s Office and some lawyers who have appellate practices. So it is a rare treat for a general practitioner such as me to appear before the justices. Also, the small number of cases that the Supreme Court accepts means that it spends much more time considering them. Arguing before the Supreme Court is a far different experience than before the Court of Appeals. First, there is simply more time for argument. I had 20 minutes this time versus the usual 10 minutes at the Court of Appeals. I did not feel rushed to make my points, and I had enough time to answer the justices’ questions. The justices were highly prepared compared to the judges at the Court of Appeals. I never felt like a justice didn’t get it. The justices’ level of preparation combined with their level of intelligence required careful preparation on my part. I tried to anticipate every question that they might ask. This is hard to do considering that the justices accept review of a case because they believe there is an important policy decision to make, yet they do not announce what that important policy issue is. In my case, there were a few different possible issues that the justices could have cared about. I had to be prepared on all of them. Arguing before a prepared and intelligent court requires quick thinking. The Supreme Court does not simply listen as trial courts often do. Nearly all of my time was spent answering questions. I had anticipated most of them. But the high-level nature of the questions makes argument before the Court challenging. I enjoy this sort of thing. But I was tired when it was over. It is important to note that the justices were very nice. They always treated me with respect. While their questions were probing, their demeanor was not challenging. Prior to my case being called, a few of the justices came out to speak to some visiting students from Afghanistan. As they passed me, each greeted me warmly. They are just nice people. Our confidence in our system of justice is one of the most important aspects of our democracy. We cannot have that confidence if we believe that our voices on justice are not being heard. I believe these nine justices will consider my client’s cause carefully. Win or lose, my client was heard.